A $200 keelboat owned by Noah Ludlow travels down the Ohio and Mississippi Rivers with 11 associates on board. Ludlow’s Noah’s Ark stopped at different locations to perform. 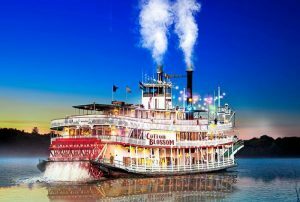 The first ever showboat named Floating Theater is created in Pittsburgh, USA by British-born actor William Chapman, Sr. He lived on the boat with his family of 9 and performed plays with music and dance at spots along the waterways. Spectators paid in either money or in goods such as fresh vegetables. The Chapman family had made enough money to afford a larger, fully equipped steam engine with a stage, named the Steamboat Theatre. Following a decline in popularity during the Civil War, Showboats picked back up again. Popular boats included the New Era, Water Queen, New Sensation and the Princess. As automobiles and road travel became increasingly popular, Showboats had to become bigger and more elaborate to maintain their appeal. Boats such as the Cotton Blossom and the Golden Rod had colourful and elaborate designs. Edna Ferber stayed on the James Adams Floating Theatre which toured the Chesapeake Bay. Here she wrote the novel Show Boat which was released later in the year. Ferber’s novel is adapted into a stage musical by Jerome Kern (music) and Oscar Hammerstein II (book & Lyrics). The show marked a turning-point for American musicals, moving away from operettas and light musical comedies that preceded it and re-defining musical storytelling. The musical previewed with a pre-Broadway tour before opening in New York in December at the Ziegfeld Theatre. The first West End production of Show Boat opened at the Theatre Royal, Drury Lane starring Cedric Hardwicke, Edith Day, Paul Robeson and Alberta Hunter. Show Boat closes on Broadway before embarking on an extensive national tour with Irene Dunne playing the role of “Magnolia”. Original producer Florenz Ziegfeld revived Show Boat on Broadway at the Casino Theatre with most of the original cast. Universal Studios release a film adaptation of Show Boat featuring Irene Dunne alongside other touring and Broadway cast members including Hattie McDaniel and Allan Jones. MGM release a revised film version of Show Boat. Although based on the original story and including many of the original songs, the film adapted many details of character and plot. A new production of Show Boat is produced by the Musical Theater of Lincoln Center and played at the New York State Theater. The musical starred Barbara Cook as “Magnolia”, Constance Towers as “Julie” and Stephen Douglass as “Ravenal”. The second West End production opened in July at the Adelphi Theatre, the production ran for 909 performances. Mickey Rooney starred as Cap’n Andy in a production of the show at the Kennedy Center in Washington, D.C. The Paper Mill Playhouse in Millburn, New Jersey created a production directed by Eddie Bracken that restored the show to be more in line with the original version. Opera North and the Royal Shakespeare Company join forces to present a revival of Show Boat at the London Palladium. The most recent major Broadway production of Show Boat opens at the George Gershwin Theatre, produced and directed by Harold Prince. Running for 947 performances, it was the longest running Broadway version of the musical to date. The production also toured the US as well as running in London and Melbourne. Show Boat is awarded a Tony Award for Best Revival of a Musical and a Drama Desk Award for Outstanding Musical. Hal Prince produces a West End run at the Prince Edward Theatre, which runs from April to September. The production received a nomination for Outstanding Musical Production at the Olivier Awards. London’s Royal Albert Hall stages its first full musical production with a revival of Show Boat directed by Francesca Zambello. Daniel Evans’ revival of Show Boat ran at the Sheffield Crucible Theatre to acclaim from critics and audiences alike including many 5 star reviews. Show Boat transfers from Sheffield, opening at the New London Theatre in the West End in April for the first time in almost 20 years.